Thank you for visiting another one of 360 Exotics's online listings! 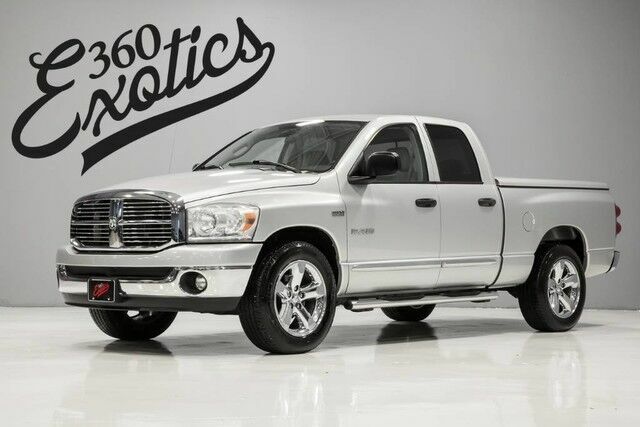 Please continue for more information on this 2008 Dodge Ram 1500 SLT with 93,506mi. This vehicle is loaded with great features, plus it comes with the CARFAX BuyBack Guarantee. Exceptional in every sense of the word, this incredibly low mileage vehicle is one of a kind. Based on the superb condition of this vehicle, along with the options and color, this Dodge Ram 1500 SLT is sure to sell fast. The 2008 Dodge Ram can be equipped for virtually any use that requires serious hauling or towing, and can meet a wide range of budgets depending on the luxuries desired. With the 4.7L V8's upgrades for this year, the Ram's middle engine provides improved performance all around, while the Hemi engine brings even better performance without a penalty at the pump, thanks to the MDS system. The Mega Cab style also stands out as providing one of the largest cabs in the industry--according to Dodge, it's tops in legroom.